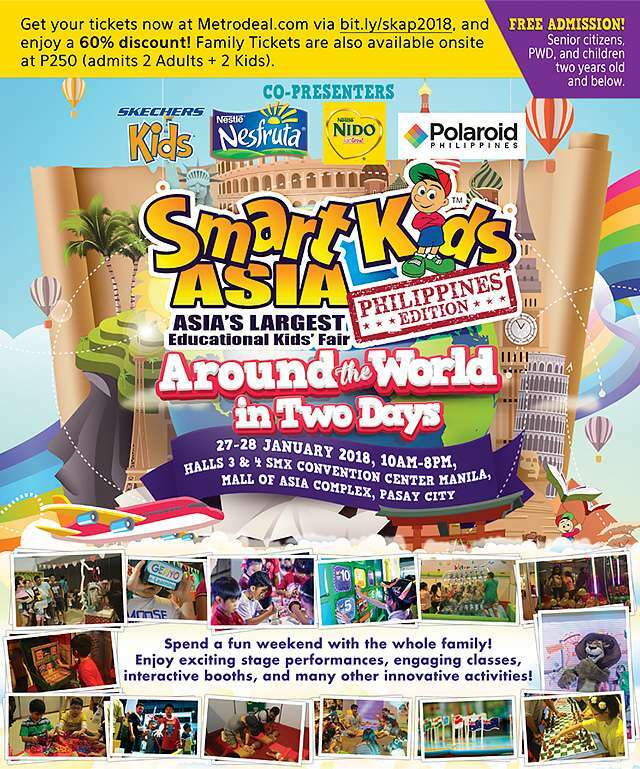 Step into a world of entertainment and education as Smart Kids Asia Philippines, Asia's largest educational children's fair, opens its gates on January 27 and 28 at Halls 3 and 4 of the SMX Convention Center in SM Mall of Asia Complex. Smart Kids Asia, initially launched in Malaysia, is now on its fourth run in the country. It brings together interactive booths, classes, stage performances, and other activities for the whole family to enjoy. Family tickets are available onsite at P250, which admits two adults and two kids (or one adult and three kids). Extra adult tickets are available for P50. Senior citizens, persons with disabilities (PWD), and children two and below get in for free. For more information, visit the SKAP Facebook page. This article is sponsored by SmartKids Asia Philippines.